Introducing the Gain Stage Black™. Stripped clean and pure. The classic sound of an unmodded, unmolested, non-hotrodded, British 100W amp as it rolled off the assembly line in 1969. The sound that changed rock guitar forever. Take your favorite guitar, plug it into the Gain Stage Black feeding a clean amp and recreate the power and glory of pure rock and roll. The Gain Stage Black started out in the design phase as a clean boost with character. I didn't want "transparency" , which to my ears, more often meant "sterile sounding. When the prototypes started sounding good, I experimented with how much gain to give the pedal. After getting it to where I thought it was a right, I had some folks play it with their rigs. When I asked them what I could do to make it better, they all said to give it some more gain. That is when it opened up and really became the Black! I began thinking it sounded very familiar to me at higher gain settings. That was when I fired up my vintage 100W and 50W Marshalls. Those very sounds were coming out of the Black when feeding a clean amp! I wanted to make sure I wasn't hearing things, so I built a handful of prototypes and sent them out to my beta-testers without telling them what I was hearing. To a man, all reported back that it was the most faithful reproduction of a classic cranked Marshall that they had heard. There are several unique features incorporated into the Black's design. First and foremost, there are no clipping diodes utilized. This allows the pedal to be incredibly dynamic and amazingly responsive to the guitar's volume control. For a true old-school experience, leave the Black on and do it all from the guitar! Another difference you will experience with the Black is how the Tone control works. Careful experiments led to the control affecting the narrow range of frequencies critical to the electric guitar. The entire control range produces a classic range of tones. Finally, a speaker cabinet compensation circuit was designed, with the switch designations, "Closed" and "Open." In the Closed position, the black is leaner and works well with closed back cabinets, especially 4X12s. In the Open position, when using open-back combo amps, the "twack" of a closed-back cab is approximated. This was the intention but both positions can be used with any speaker cabinet type and you are encouraged to experiment! How is Gain 3 and Tone 3 Connected? Can't find a schematic to compare to, but as there's no indication i believe they are both unconnected. Thanks. The TL071 datasheet specifies Pin8 NC and Pin 7 Vcc+. I got this pedal working well after connecting the diode to Pin 7. Note.Electrolyte 47uF and resistor 22K also have to be reconnected to Pin 7. Did you use the 33p or something different? I used 33p. Sound and tone to me is good. Tim, my Tone Pot also offers little to nil variation, although the pedal has a good british sound. 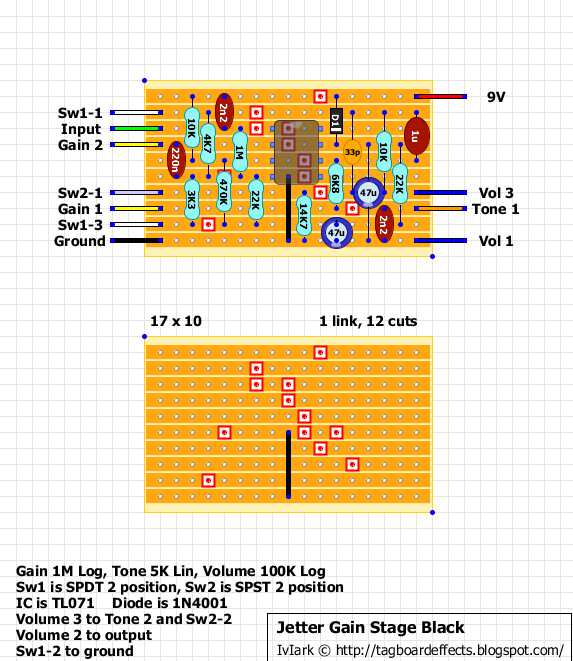 I cant find a schematic for this pedal. But what I do if the pedal has too much treble is change capacitors around the tone control. But there is a cost. You lose clean sound when you go for more bass. To get more bass I increase the Cap value around the tone area EXCEPT when the Cap is connected to Ground I do the opposite, I Decrease the value to get more bass. (Experiment to what sounds good to your ears. Thats what is important). Have a go at changing the 2n2 Cap between Tone1 & Vol 1. I am also going to have a play with this. Thanks. Tim, I just slotted this 2n2 Cap and tried the Following Cap Values. The Tone Pot although very subtle is more noticeable on the higher Cap Values. 1.5nF = More Treble. 2.2nF As per Design. 22nF = More Bass. 33nF = More Bass Darker. 47nF More Bass more Darker maybe starting to lose clarity. I liked 33nF. Up to your own preference. Hope this helps. ie. Only tested at bedroom levels. Here's the schematic I did it from. Daft question but you did link Volume 3 to Tone 2 didn't you? Just checked. On my pedal Vol 3 is linked to Tone 2. I also tested the 33pf Cap and believe whatever the right value is this cap gives this pedal a bit more life. This cap as per the schematic can be removed completely and still sound good. 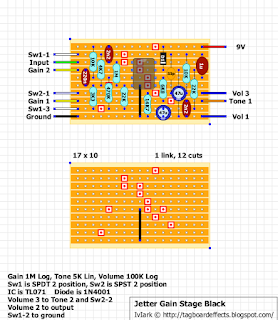 The pedal will still work and the schematic shows why. I also tried 33nF and is also good. Depends on personal preference I guess. Thanks a ton for the reply. That 2n2 was in my sights. I remember I played with the tone cap in the Ecstacy that I built. Went from 22n down to 10n on that one because I needed a little more treble from that one. I figured I could raise that 2n2 here and get a little more bottom - good to get the confirmation before I go tearing into it though. I'll stick a socket in there to test a couple but I'll probably use that 33n. I generally use single coils so I just need to darken it up a bit. My vol 3 is linked to tone 2 as well. Tim, I also socketed what looked like the "input cap" on the schematic ie 47uf Cap on the bottom of the board and replaced it with 100uf cap and prefer the deeper tone. Might also be worth looking at. I left the 33nf cap in the tone area. The 2n2 is the input cap, the 47u at the bottom is the filter cap for the 1/2 supply rail. ok Thanks Mark for that. Is it worth socketing the 2n2 cap and changing it to see if a deeper tone can be achieved? So is there a cap that can be manipulated to give tone control a little more functionality? Would upping the tone pot to 10k make the tone a little more rangey? Sorry. I just looked at the layout again. Is the 2n2 down at the lower right of the layout not for the tone circuit? That was the one I was alluding to and I think Jon was as well. The bottom right 2n2 is the tone cap, the top left 2n2 is the input cap. It would be worth experimenting with both, the tone cap for the obvious reason of it's interaction with the tone pot, and the input cap because increasing it should let more low frequencies into the circuit. Cool. I just read back. I noticed you were just responding to Jon making reference to the 47uf input cap ( which is not the input cap ) in mentioning the 2n2. I just got confused there for a moment. I'll socket the tone and input caps this weekend and experiment with those. Thanks for the Cap information & clarification Mark. Much appreciated. So, finished up the tweaks today. Ended up with a 10n for the input cap. Changed the tone pot to a 10k and used a 22n for the tone cap. Now the tone control is very usable across the range of different gain settings. Sounds a little nicer with my higher output single coils ( around 7k-ish ). Has an almost fuzz character to it in higher gain settings ( to my ear anyway ). Almost like the strings are each wearing a big sweater. Not muffled - just kinda "woolly". Not crazy versatile but it does what it does quite well.